ALL new patients receive a Free first exam! Pet Emergency? Call us right away at 360-881-0099! Tender Touch Animal Hospital is more than pet care! We take pride in our compassionate approach to veterinary medicine, one that blends traditional practices with gentle techniques for the most comprehensive animal care in the region. Patients of Tender Touch Animal Hospital enjoy comfort and quality in our state-of-the-art facility. Preventive care is the foundation of our wellness program - your pet receives a customized plan to promote wellness and enhance the human-animal bond. We practice internal medicine and surgery using the most advanced technology and techniques, enhancing your pet's overall health and recovery from illness or injury. Managing illness or receiving routine services, your animal companion is always treated to the highest quality veterinary care. Your neighbors in companion animal care. Hello, my name is Sneaky, and I was born in May 1995. This is my mom, Dr. Monica Wlodarchak, in the picture with me. She rescued me when I weighed only one pound; just a baby found stuck in some sticker bushes along the side of the road near Silverdale. Hello, my name is Lucky, and I am the small dog in this picture with my mom, Ann Marie, and my older and bigger sister, Betty. We make up part of our whole family which includes my two legged Dad, David. Hello, my name is Nayeli! I was born in 2011 and when I was only three months old, I began exploring the world all on my own looking for my family. "Everyone at Tender Touch are so awesome! First place my DOGS love to go!" "I can't stress enough how amazing Tender Touch is! Absolutely amazing!" "I have been going to Dr. Monica for 13 yrs. She and her staff are amazing and compassionate. 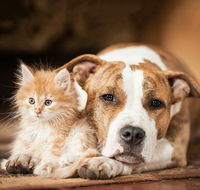 I trust them completely with all 4 of my dogs and 2 cats."